Pegged to arrive on May 25th, Solo: A Star Wars Story is currently simmering in post-production, where Ron Howard and the technical wizards of Industrial Light & Magic are running the rule over Han Solo’s maiden voyage. 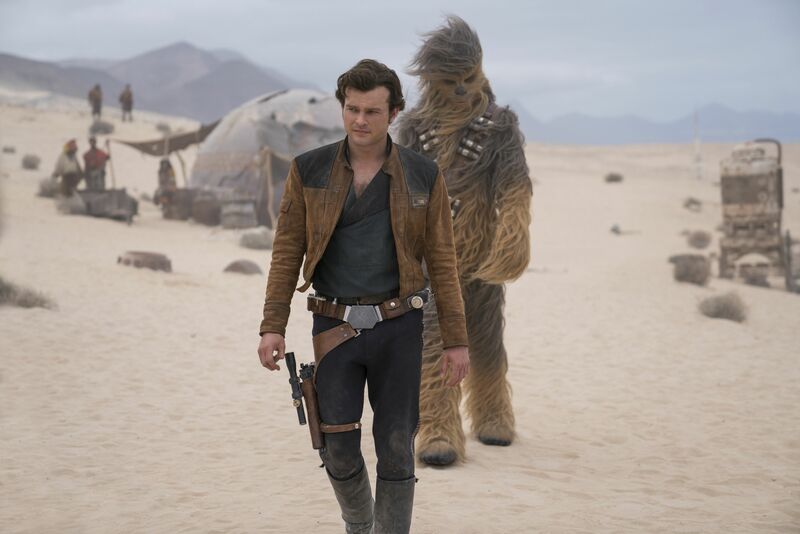 It’s shaping up to be a doozy, too, what with the all-star cast – Alden Ehrenreich, Emilia Clarke and Donald Glover…to name but three – and incredible attention to detail. Much like The Force Awakens and The Last Jedi before it, there also appears to be a greater emphasis on practical effects over CGI – gone are the days when 75 percent of a Star Wars movie was rendered digitally. And while that’s all very exciting, there’s still been an unmistakable air of concern surrounding the pic for months now. Thankfully, though, that’s starting to ease up a bit. The latest trailer certainly went a long way in getting people on board and now, Lucasfilm has released a new TV spot, offering up some fresh footage that again, paints a promising picture of what’s to come next month. At only 45 seconds in length, there’s not a ton in here that we haven’t already seen, but there is some new stuff of Han and Chewie, as we watch their relationship begin to take form. At one point, we see the smuggler asking the Wookie for his name, while other moments show them playing cards, engaging in some banter and bonding over the adventure that Solo sets them on. Again, it’s not much, but we’ll take whatever new footage Lucasfilm is willing to offer up at this stage and are definitely intrigued to learn more about how this iconic duo first became such close pals. Solo: A Star Wars Story graces theaters on May 25th. It’s the second Star Wars anthology pic to tumble off the Disney/Lucasfilm production line, what with Episode IX set to bring the curtain down on the current, mainline trilogy late next year. J.J. Abrams is in charge, and filming is due to commence in the United Kingdom this summer.